We are sure that you did not imagine that the variation of watermelon guacamole existed... well this guacamole is super refreshing, juicy, aromatic and a bit spicy . You have to prepare it to prove that in the Mexican cuisine the limit is set by your imagination. Just as in other guacamoles many ingredients are used, which are combined among them to create an exquisite flavor. The curious thing about this guacamole is that you will find the watermelon chunks over the guacamole, these are not mixed so they can keep their consistency and thanks to this the watermelon guacamole looks divine . – If you are new in the world of guacamoles. This recipe can be seen as an avocado dip , to which pieces of other ingredients are put to enjoy different textures, consistencies and flavors. The watermelon guacamole is exquisite and delicate – a fresh bite full of flavor. Ideal as a snack to enjoy on a summer afternoon accompanied of some tortilla chips and a delicious Mexican drink. We assure you that the preparation of this guacamole is very simple. If you can get seedless watermelon to prepare this guacamole it would be phenomenal, you will save a lot of work. 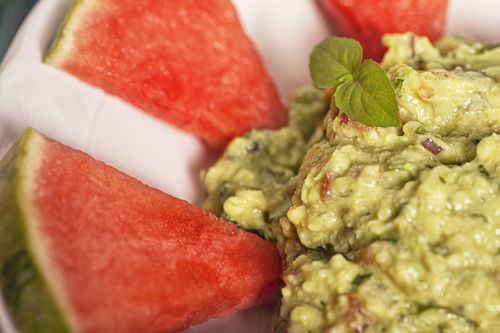 The watermelon guacamole is seasoned with fresh basil leaves that provide mint aromas and spicy flavors. If you don’t have fresh basil it can be substituted for 2 teaspoons of dried basil. In this guacamole besides using lime juice, also orange juice is used because it combines very well with the watermelon and it gives a fruity touch. Only 10 minutes are needed for this preparation. Dice 1/4 of a watermelon and try to remove all the seeds that you can; then reserve. Finely chop the serrano pepper with the one you worked and reserve. Separate from 4 basil sprigs the leaves from the stalks and discard the stalks. Finely chop the basil leaves that were separated, then reserve. The juice of 1/2 Orange. Insert in the guacamole, the avocado pit that was reserved. Put over the guacamole the watermelon dices that were cut. Upon completion don’t mix the ingredients because the watermelon consistency will ruin and also of all the guacamole. * This guacamole has to be eaten on the spot because the avocado oxidizes fast and the watermelon will soften fast. Variation: If you would like to try another guacamole with fruits, we recommend the guacamole with pomegranate, jicama and mango. This watermelon is juicy, sweet and it has very good flavor. Just what you need for this guacamole. You can also serve this guacamole in a molcajete. We assure you that everybody will love it. With this product you will get the convenience of having dried basil leaves with its fresh flavor. A very innovative concept.